Back in the mid-1970s, Jerry Husted was building a lovely ketch-rigged sailboat called the Ingrid 38 in Woodinville, Washington, a semirural community east of Seattle. Along with others, he was sitting in long gas station lines worrying about rising pump prices and fuel shortages. The story was no different for boaters. Gas cost a fortune and was hard to find. Many boats simply sat parked while the politics of petroleum threatened to cripple the nation. Sorting through the issues, Husted concluded that powerboaters needed a vessel that wouldn&apos;t cost a fortune to buy and operate. Husted did more than dream. He built a spunky craft that looked a lot like a tugboat and introduced it to the boating community in January 1980 at the Seattle Boat Show. It was called the Nordic Tug. The show price was $29,900. The 26-footer was powered by a three-cylinder, 36hp Volvo diesel so efficient that Husted bragged it could run the 600 miles from Seattle to Ketchikan, Alaska, without stopping to refill its 50-gallon fuel tank. It cruised at about 6-1/2 knots, using about 2 quarts of fuel an hour. At a marketing consultant&apos;s urging, Husted set a sales goal for the boat show: he would sell three of his new tug yachts. What happened was something Hollywood might contrive. The first boat sold minutes after the show opened, and by the conclusion of the 10-day event, he had sold 33. As January ended, Husted had orders for 54 boats, even though the price was bumped to $39,900 after the boat show. His huge worry was how to build them all. The guys coming to the boat show liked the macho styling of the raised pilothouse and the fake smokestack, Husted remembers. And women were charmed by the cozy interior, including a tiny wood-burning stove in the pilothouse. No wonder they sold like crazy. Since then, Nordic Tugs has built 800 tug yachts, ranging in size from the original 26 to a 54-footer. Husted no longer owns the business, but he has remained with the company nearly three decades and today probably is best known for having conducted sea trials for all but a handful of those 800 boats. He also is a member of the company&apos;s board of directors and is corporate secretary for the business. Jerry Husted recently celebrated his 80th birthday. And the man who launched the tug yacht era is retiring. If you think he&apos;s going to gather up his wife, Nancy, and go cruising, guess again. As a builder of sail and power boats, he&apos;s spent many days at sea. In retirement, he&apos;s more likely to go kayaking or bicycling, or do some cruising on his motorcycle. He may build a small airplane-it wouldn&apos;t be the first he&apos;s put together in his shop-or he may try assembling one of the helicopter kits on the market today. And there&apos;s always bird watching, which fascinates and pleases him. He has a bird feeding station at the Anacortes home he shares with Nancy, and an everchanging flock performs just outside the window. In January 1980 I was a novice boater in Seattle. I attended the show at which Husted debuted the Nordic Tug, and I remember gaping at the new tug yacht and all the other boats on display. I knew about Jerry Husted, although we had not met. I was a reporter for The Seattle Times, and at the next desk sat Glen Carter. He was the last of the old-time marine editors, the guys who walked the docks, called tugboat skippers by their first names, and knew well the waters of Puget Sound and beyond. He bought an Ingrid 38 from Husted in kit form and set about finishing the boat himself. Carter shared every moment and misadventure with me, often more than once. Whenever he was stuck, he would start dialing his gang of waterfront friends and acquaintances, including Husted, for advice and help. 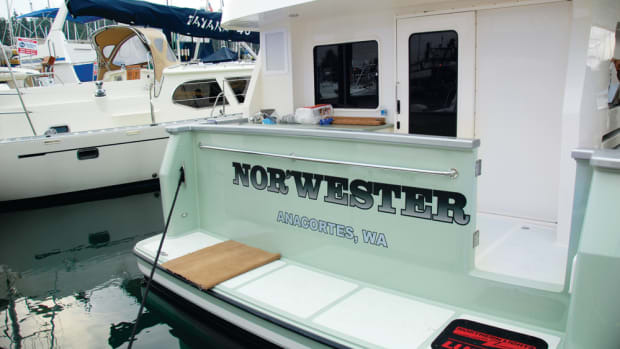 Carter finished the boat and sailed her in the Northwest, finally retiring to a liveaboard slip in Poulsbo, Washington. The Ingrid 38 is a William Atkins interpretation of a Colin Archer design. Husted and Jim Musser had started building that sailboat in the early 1970s. Their business was named Blue Water Boats. Later, Husted acquired Musser&apos;s interest and sold Blue Water Boats after the gold-rush success of the first Nordic Tug. Husted often called on a Seattle boat designer, Lynn Senour, for assistance in designing sailboat interiors. Senour was already well known in the powerboat world for his tremendously powerful and fast Marlineers, wood sportfishing yachts that were popular in Mexico and California, and for many boats built by Grandy in Seattle after World War II. They talked boat design over lunch or drinks after work. Husted pitched his idea for a small, efficient powerboat. Senour suggested a traditional design; Husted argued for tug yacht styling. Finally, Senour drew the lines, inspired by tugboats of the 1930s. His tug yacht theme continues today. More important, perhaps, was Senour&apos;s genius in designing the underwater portion of the boat. He developed a hard-chined bottom that proved to be efficient at the slow speeds of the first Nordic Tugs and at the higher speeds of later generations of tugs. Senour continued to contribute design ideas to the company until his death a few years ago. Husted had introduced me to Senour in 2002 while I was gathering information for an article about the designer (see PMM Jan. &apos;03). We drove to Seattle together for lunch with Senour, and their sharing of anecdotes contributed significantly to the story. Nordic Tugs had a simple and low-budget beginning. In 1979, Nordic Tugs, Inc., was founded, with Husted as president. Gail Davis, a teacher, small-business owner, and avid boater, became vice president and treasurer. Jerry&apos;s brother, Jim, a retired Air Force colonel, joined management as a vice president. Each contributed $20,000 to get the business moving. Husted&apos;s sailing background influenced his first powerboat. "It had one car battery for electric starting and a couple of lights," he recalls. "And it had a foot pump for the water system. We were so sail oriented that we didn&apos;t think we needed electric lights. We thought that a lantern was OK. Powerboaters quickly brought us up to speed." Another nod to the influence of sail was the use in two tug yachts of hand-cranked diesel engines. Each had a gearbox and a feathering prop. Others watched the success of the first Nordic Tug and quickly jumped into the market with such boats as the Lord Nelson Victory Tug and the Sundowner, almost a carbon copy. Both failed, although a number of these boats are still cruising today. Nordic Tugs&apos; most direct competition now comes from the American Tug, a boat with less obvious tug styling that was first launched in 2000 in nearby La Conner, Washington. American Tugs&apos; founders all once worked for Nordic. Through it all, Husted tested the boats. When the company was based in Woodinville, sea trials took place on Lake Washington. More than 20 miles long, the lake can be nasty in a big breeze. When the plant relocated to an industrial park near Burlington, Washington, in 1990, sea trials moved to Guemes Channel at Anacortes. It can be challenging when the wind meets a 3-knot current. "We go in any weather," Husted tells me. "There always is a rush to deliver, but common sense prevails. If it&apos;s blowing 25 or more, we do something else for a while. Winds usually die down in a few hours. "To get off the dock when we&apos;ve been pinned by the wind, we have had to get another boat to pull on our stern cleat, but I have never been caught away from the dock in a storm we couldn&apos;t cope with." Early sea trials required a half day at sea and answering questions on a single sheet of paper. Today, they are far more complex and time consuming. Sea trials may stretch over two days, and they involve voluminous reports, on paper and on a computer. Husted mimics real-life operating conditions by running the engine hard and then shutting it down and allowing it to cool. Then it&apos;s started and pushed hard once more, and turned off for another cooling session. Then he does it again. One objective is to stress the craft&apos;s systems to the breaking point-if that happens-to avoid having the buyer experience that kind of distress. So the Nordic Tugs are driven hard, the throttle jammed to full position and the rudder cranked hard over. Husted usually has two others aboard during sea trials, and everyone has a job, including testing every faucet and valve, checking hose and fuel line connections, even turning on the galley stove and the shower and aligning the engine if necessary. 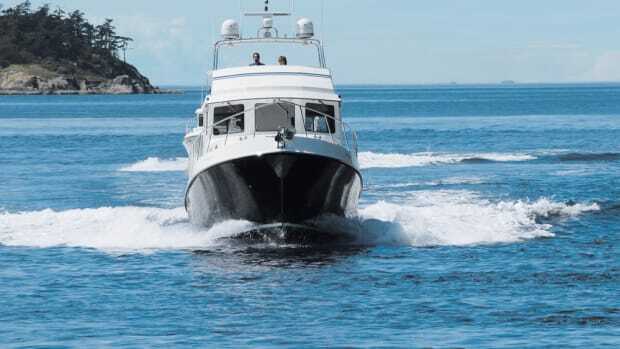 Extensive sea trials are costly, but the company doesn&apos;t see a lot of warranty claims because problems are shaken out and corrected before delivery. Although he may test up to 60 boats a year, there are some sea trials Husted will never forget. The first one that pops into his mind is the testing of a 26 in Lake Washington years ago. Husted had dropped his crew on one side of the lake and then turned toward the opposite shore, where he was to meet a truck and trailer at a launching ramp. When he was halfway across the lake, he remembered that no one had tested reverse gear. The fiberglass propeller shaft tube disintegrated as he shifted into reverse. Water gushed into the bilge. This was before cell phones. Husted used a VHF radio to contact a marine telephone operator. Husted called his office and asked to have the tow truck and trailer speed to the launch ramp now. As he approached the landing, the 26 settled deeper into the water, until the waterline had moved from the boot stripe to about halfway to the deck level. Moments from sinking, Husted drove the small tug yacht onto the waiting trailer. He also remembers dealing with three "runaway" diesels. Such engines rev to maximum rpm and beyond. They run screaming out of control and do not respond to throttle commands. The only way to stop them is to choke off the air supply. Each time, the sea-trial crew gathered all the rags on board and stuffed them into the engine intake until the diesel quit from a lack of air. The experience didn&apos;t harm the engines and the problem was easily fixed, but it took the crew a long time to get the rags out. Today&apos;s boats are 10 times as complicated as the early 26 Nordic Tugs, Husted says. In those days, he was satisfied if the boat would move forward and in reverse. Today, testers routinely nitpick such factors as propeller performance. Husted says he&apos;s pleased the company has begun using five-bladed props on some boats because they respond better, slip less, and run smoothly. Obviously, the first tugs were simple in design and construction, but their seaworthiness is proven by the fact that the earliest 26-footers are still in service. Modern Nordic Tugs are a world away in terms of engineering, construction quality, and complexity of systems. And none of them will get by on 2 quarts of fuel an hour. The 26 originally was offered in two models: the Red Apple (the cruising version) and the Cricket (a fishing/workboat version). It no longer is built because Nordic Tugs, like other production builders, found that smaller boats cost more to construct than they would fetch on the recreational market. Husted learned about that years ago when he built a Nordic sailing dinghy and offered it at $2,500. Customers were aghast at the price. Some did buy the dinghies, "but I lost my shirt on every one I sold," Husted says. 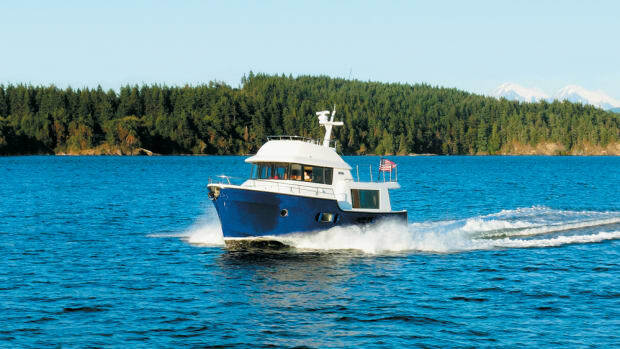 Today, Nordic Tugs offers a 32 (introduced in 1985 with a six-cylinder engine and speeds to 14 knots), a 37, a 42, and a 54. The company will launch a 47 late in 2008. All Nordic Tugs are nicely done, but first reports indicate the 47 will be upscale posh, designed to appeal to yachting&apos;s huge new market: the affluent baby boomers who will be retiring over the next few years. Designed by Howard Apollonio, the 47 will be priced at about $900,000. Nordic is building a 30,000-square-foot assembly building to accommodate construction of the larger yacht. Nordic Tugs now are fitted with engines of 500hp, and they cruise easily at speeds in the teens. There isn&apos;t a wood-burning stove to be found. Today&apos;s tug yacht likely has a furnace and/or air conditioning, a refrigerator and freezer, a TV set, a sophisticated, computer-controlled engine, an electric water pump, a water heater, and a watermaker. You can still find the Nordic Tug trademark, the tug-like faux smokestack. Nordic Tugs doesn&apos;t allow buyers aboard for sea trials. However, several years ago Husted invited me, as a PMM writer, to board a 37 for its sea trial (see PMM March &apos;03). The owner was allowed to come to the harbor and watch the launching of his new boat, but he waited on land as we roared out to sea. Then, as now, Nordic Tugs assigned one of its production-line employees to the sea-trial crew. For many, this is their first time aboard a boat, and I recall one such employee showing both pride and a little fear when Husted told him to take the wheel and steer toward a point of land in the distance. A sea trial is what brought Jerry and Nancy Husted together. Both attended Whitman College, in eastern Washington State, shortly after World War II. They knew each other then but went separate ways after graduation and lost touch. A few years ago, Husted was returning a Nordic Tug to Anacortes after a sea trial. A veteran sea-trial associate, Russ Asbury, was aboard. They passed a large rowing boat with a team of women working the oars. Russ pointed out Nancy Ashenfelter, a family friend, and commented that she had attended Whitman College. Husted recognized her, and phone calls followed (Husted asked Asbury to make sure Nancy would welcome his call). They were reunited. It was a longdistance romance; he lived in an adjoining county and she was in Anacortes. They often met in an in-between town for dinner and a movie. Nancy knows a lot about the sea. She and her late husband, Pete, rowed an open boat to Southeast Alaska and then wrote a book about their adventure. The romance with Jerry left Nancy&apos;s large circle of Anacortes friends smiling and dewy-eyed, according to those who watched it happen. He and his wife are members of a health club in Anacortes. She exercises faithfully and he has promised to work out more often, and to try yoga and pilates, too, as he moves into retirement. Husted years ago built a small aircraft and flew it from a grass strip at his home in rural Snohomish County. "I still dream about motorcycles and airplanes," he confesses. "I would love to build one and see it fly." Husted doesn&apos;t use his motorcycle, a small Suzuki, all that much. "I&apos;ve got to be honest," he tells me. "I wash it and I touch it in the garage. It has under 2,000 miles on it." Continuing the honesty theme, Husted admits he could not cut every tie with Nordic Tugs as he retired from sea-trial work. As mentioned earlier, he continues to serve on the board of directors, and he has let company officers know that in a pinch-a real emergency-he just might be available for a sea trial. For years, Husted has enjoyed the use of a reserved parking space marked with his name and the word "founder" at the front door of the Nordic Tugs office. I hope he keeps that, too.